technologies coupled with the know-how and experience to provide customized wastewater treatment solutions. The sludge resulting from wastewater treatment operations and processes is usually in the form of a liquid or a semisolid liquid that typically contains 0.25-12% solids by weight, depending upon the operations and processes used. The volume of sludge is larger and hence it’s processing and disposal is perhaps the most complex problem due to the presence of the organic matter present in it at the end of biological treatment. Different operations are performed on the sludge to provide a relatively constant, homogeneous feed to sludge processing facilities. 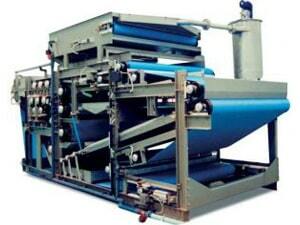 Filter Press is a dewatering unit which is used to reduce the moisture content of the sludge and biosolids. 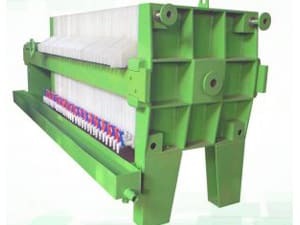 The fixed volume, recessed plate filter press consists of series of square plates, recessed on both sides that are supported face to face in a vertical position on a frame with a fixed and movable head. A filter cloth is hung or fitted over each plate. The plates are held together with sufficient force to seal them to withstand the pressure applied during the filtration process. In operation, chemically conditioned sludge is pumped into the space between the plates and pressure of 100 to 225 lbf/in 2 is applied and maintained for 1 to 3 hr forcing the liquid through the filter cloth and plate outlet ports. The plates are then separated and cake is removed. The sludge cake thickness which varies from 25-45 mm and the moisture content of the cake varies from 48-70%. Belt filter allow continuous sludge dewatering between two filter belts. It has different zones through which sludge passes. Flocculator: The sludge flocculent blend is done in the flocculator and then flocculated sludge is evenly distributed on the filter belt. The inlet stream is stilled upon entry into the clarifier. Hoppers are kept at the bottom of the clarifier to collect the solid particles which are settling down and the clarified liquid exits. A gravity drainage zone: The sludge is drained on the first belt while the drainage is helped by the picket fences which are lying freely on the belt Water line is created and the majority of the water by flocculation is eliminated. Water line is created and the majority of the water by flocculation is eliminated. Up to 4 bars for low-pressure belt filters. Up to 5 bars for medium pressure belt filters. Up to 7 bars for high-pressure belt filters. A cake scraping zone: Once pressed, the sludge has a more solid aspect. It is called a sludge cake or simply cake. This cake is then scraped off from the surface of the two belts that separate at this level. A high-pressure washing station: A bank of nozzles under 7 to 8 bars (100 to 120 PSI) continuously cleans each belt. Screw press is a type of machine in which a ram is driven up and down by the screw. It uses a coarse screw to convert the rotation of the lever into the downward force. The lever usually incorporates balls as flyweights. These weights help to maintain the momentum and thrust of the tool to make it easier to operate. The principle of the centrifuge, also known as centrifugal decanter, is to use centrifugal force to accelerate the solid-liquid separation. 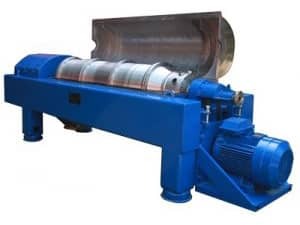 A centrifuge is a conical cylinder decanter that turns horizontally on its axis with a clarified water overflow, and the dewatered sludge being removed by an Archimedean screw. The rotation applies a centrifugal force on the solid particles which then moves a lot more quickly. The flocculated sludge is injected inside the centrifuge bowl through an injection pipe. The bowl has a high rotation speed and the particles are flattened against the bowl’s sides in the clarification zone. These particles are then pushed by an Archimedean screw towards the end of the bowl’s cone in the sludge spin-dry zone. The clarified liquid called centrate, is evacuated at the other end of the bowl by overflow.